Now that Fed Chairperson Yellen’s testimonies are done, let’s sit back and take stock of some of the major points that she made, shall we? Specifically, let’s take a look at Yellen’s views on the U.S. economy and monetary policy. Overall, a pretty upbeat assessment of the labor market. The only thing that disappointed Yellen was that the jobless rate for “minorities remain significantly higher than the rate for the nation overall.” But again, an upbeat assessment overall. Yellen highlighted the recent rise in inflation, attributing it primarily to “the diminishing effects of the earlier declines in energy prices and import prices.” However, Yellen noted that the personal consumption expenditures (PCE) index, the Fed’s key inflation indicator, only rose by 1.6% in the 12 months to December 2016, which is still a few ticks away from the Fed’s 2% inflation target. Yellen was quick to add that the reading is still “up 1 percentage point from its pace in 2015,” though, giving her statement an optimistic spin. Overall, an optimistic view on inflation, with a noticeably more hawkish tone compared to the February FOMC statement. However, Yellen lamented that “business investment was relatively soft for much of last year.” Yellen blamed the weakness in investment spending on “weak foreign growth and the appreciation of the dollar over the past two years,” which restrained investment in the manufacturing sector. Another factor was the higher mortgage rates, which restrained housing construction and may continue doing so. Congressman Andy Barr later grilled Yellen on U.S. growth during the second day of testimonies, citing the Fed’s past forecasts on GDP growth and the resulting downgrades whenever growth fell short of expectations, which happened more often than not, so much so that Congressman Barr referred to it as a “serial failure” on the Fed’s part. As usual, though, Yellen gave the usual caveats, saying that “the economic outlook is uncertain, and monetary policy is not on a preset course.” She also noted that uncertainty from possible changes in U.S. fiscal and other policies “could potentially affect the economic outlook.” Although she didn’t really provide any details when grilled during the Q&A session. Moving on, Yellen was also asked whether the Fed has any plans to shrink the Fed’s “bloated” balance sheet during the Q&A session of both testimonies. And for reference, the Fed’s balance sheet currently stands at around $4.5 trillion. Yellen replied on both occasions that the Fed won’t be shrinking the balance sheet until the Fed Funds rate is “high enough to be reduced again in the event of economic turbulence.” During the second day of testimonies, Yellen was asked to quantify “high enough“. And, well, Yellen gave a rather evasive answer, saying that “there’s no unique level“. Yellen did later say that the Fed “would be discussing reinvestment policy in greater detail” in upcoming meetings. By the way, the Fed’s current practice is to maintain its balance sheet by reinvesting principal repayments, thereby creating artificial demand in the bond market, which depresses bond yields and helps keep long-term borrowing costs low, thereby helping out companies (and consumers as well). My point here is that rate hikes are not the only way to remove accommodation, since shrinking the Fed’s balance sheet means lower artificial demand for bonds, higher bond yields, and higher-borrowing costs (as well as a stronger dollar). Basically, a similar effect on borrowing costs as hiking rates. The market was taken by surprise by Yellen’s rather hawkish rhetoric during the first day of testimonies. As such, the Greenback rose together with rate hike expectations. 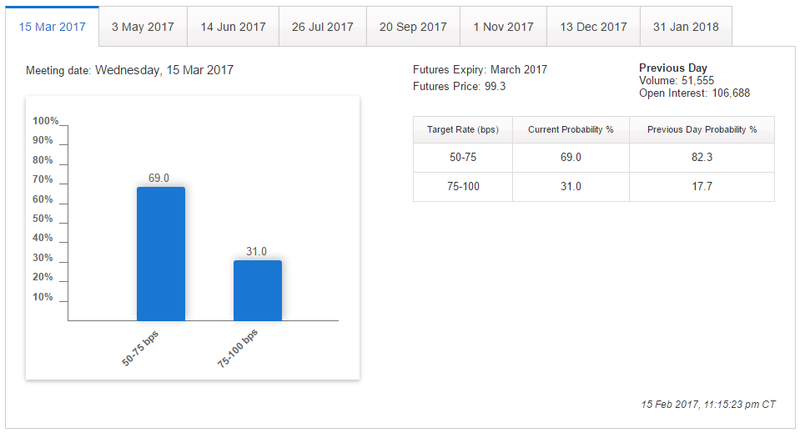 Odds for a March rate hike, for example, rose from 13.3% to 17.7%, according to the CME Group’s FedWatch Tool. By the way, if you have no idea how to read the CME Group’s FedWatch Tool, or have no idea what’s it all about, you can check out my quick primer about it here. 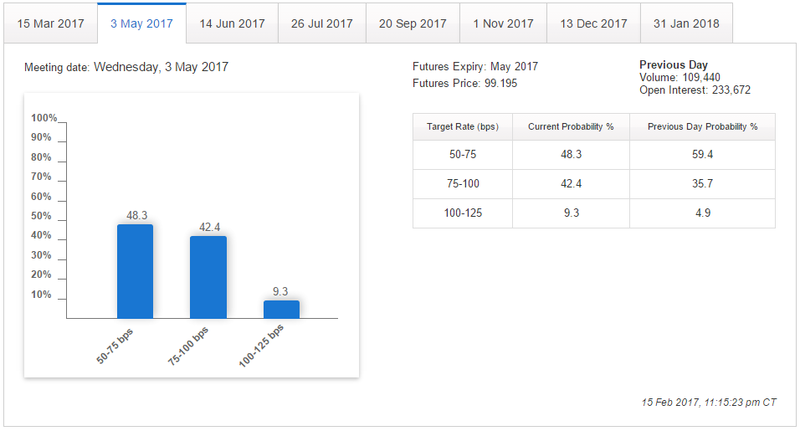 Rate hike odds don’t go above 50% until the June FOMC meeting, though. 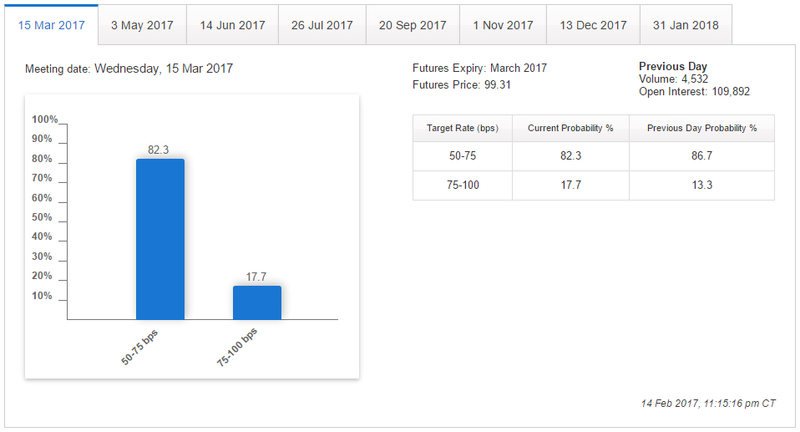 By the way, the odds for a June rate hike improved from 65.3% to 68%. The second round of testimonies also helped improve rate hike odds, especially since positive U.S. economic reports were released ahead of Yellen’s testimony. Odds for a March rate hike surged to 31%. 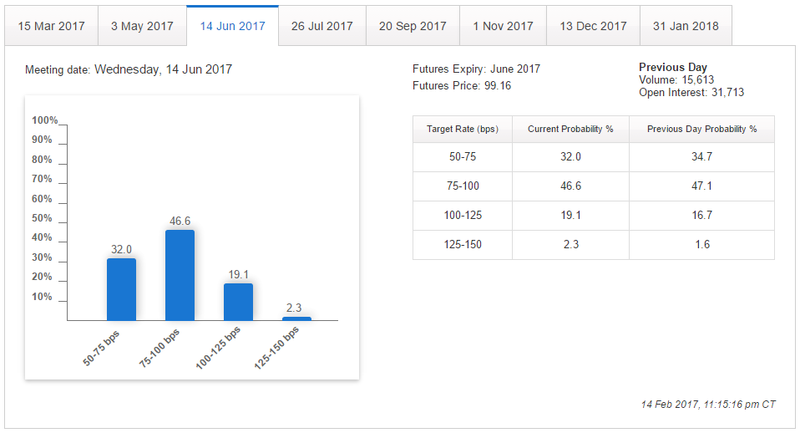 And odds finally went above 50% for the May FOMC meeting, instead of the June FOMC meeting. To be more specific, rate hike odds in May jumped from 40.6% to 51.7%. Despite the higher rate hike expectations, the Greenback tanked just before and after Yellen’s testimony. Some market analysts blamed that on profit-taking after an 11-day Greenback rally. Other market analysts, meanwhile, placed the blame on disappointment over the details of some of the U.S. economic reports. Yet others also point to U.S. bond yields coming off their highs and the disappointing turn in Yellen’s rhetoric during her second testimony, particularly her comment about “disappointing” U.S. economic performance. I kinda lean more towards those who point to profit-taking and U.S. bond yields pushing away from their highs. As noted earlier, Yellen did stress that the Fed plans to hike rates to a “high enough” level first before shrinking its balance sheet. Her comment about “disappointing” U.S. growth, meanwhile, is within the context of the Fed’s dual mandate. And growing the economy at a faster pace is not one of them, as Yellen explained. Having said that, do you think a March rate hike is in the cards? Share your thoughts by answering the poll below!